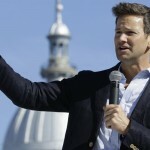 The Congressional Ethics Office appears to be taking the first steps towards launching an ethics investigation into Rep. Aaron Schock, and a new look into the nearly $80,000 tax dollars the Republican from Illinois spent on furniture in 2009 appears to show a rather unorthodox purchase. Schock’s office paid $5,113 to Mulnix Industries, a firm that, among other things, made an almost-exact replica of the podium use by President Obama. While Mulnix’s general manager couldn’t firmly confirm the sale, he said it was “very likely” that the model – known simply as the Presidential – wound up in Schock’s hands. Those hoping to score a similar podium from Mulnix won’t find one anymore, though: Even at $5,000 a pop, the company says the production process was too labor-intensive to turn a profit. Read more at Buzzfeed.